The Earl and Countess of Wessex show off their beautiful son, James Alexander Philip Theo yesterday in Windsor Castle’s private chapel. Edward and Sophie beamed with pride as four-month-old James was baptised, the first male grandchild for the Queen since Harry was born 23 years ago. 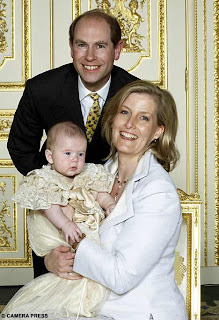 James became the first Royal baby to wear a hand-made christening gown commissioned by the Queen. The gown, made by the Queen’s dresser Angela Kelly and Buckingham Palace’s team of dressmakers, is a replica of one of Queen Victoria’s daughters’ christening gowns which was worn at subsequent Royal christenings, including that of James’s four-year-old sister Louise, but has now been preserved. “His sister Lady Louise absolutely dotes on her little brother.